1 . Weather !!! What’s the weather going to be like in ………..??? The million dollar question. 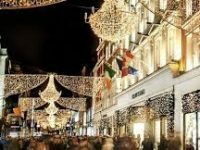 Ireland has a mild, temperate climate and although often rainy, it’s possible to visit at any time of year. Pick of the months are March to May and September to November, as the weather isn’t as cold as during the winter months and you avoid the peak months. Spring traditionally starts on February 1st according to the calendar, however meteorologists in Ireland still deem February to be Winter, quite often for good reason! However, in February’s defence there’s an abundance of bright yellow daffodils in bloom and you get to say a favourite Irish phrase ‘Isn’t there a grand stretch in the evenings’ for the entire month meaning light is returning, the days are getting longer and people look forward to replacing the long Winter nights by the fire with getting out for evening walks and other activities. 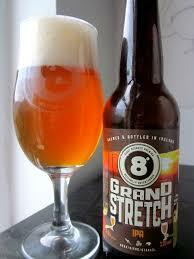 Eight Degrees Brewing have even brewed a tasty IPA of the same name – Grand Stretch! Temple Bar TradFest has been running since 2005, it’s an annual music and culture festival that takes place in late January in Dublin. Temple Bar is a pedestrianised area of cobbled streets which has a lively pub scene that is popular with tourists. Venues worthy of checking out are The Palace Bar, The Temple Bar Pub, Oliver St. John Gogarty’s and The Auld Dubliner. The five day festival celebrates traditional Irish and folk music and cultural offerings and attracted almost 25,000 visitors in 2017. It is one of Ireland’s few independent and not-for-profit festivals. The festival has carved out a niche in attracting some of the biggest names internationally in folk and traditional Irish music. Our most well known festival around the globe is St Patrick’s Day, a religious and cultural holiday. It’s said Patrick was captured by Irish pirates from his home in Britain and taken to Ireland as a slave aged 16. He was a shepherd for 6 years before escaping and returning to his family. After becoming a cleric, he returned to Ireland to spread the word of Christianity and had become our Patron Saint by the 7th century. 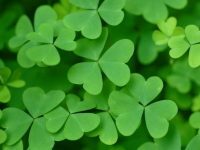 St Patrick’s Day falls on March 17th, the supposed date of his death. The Dublin parade is always a great spectacle to witness pageantry and performance on the streets of Dublin. 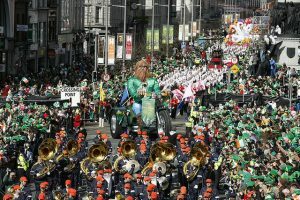 Bands from Ireland are joined by music ensembles from around the world and perform impressive music and dance on this energetic and colourful procession around the city. Most towns in Ireland host a smaller event with local brass bands, dancing groups and local business’s taking part. It’s a day of celebration throughout Ireland. Easter is an important holiday in the Irish calendar as there are historical commemorations for the Easter Rising. 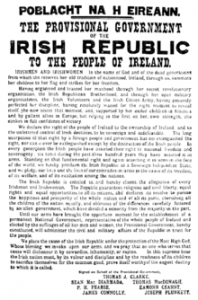 The Rising was held from April 24th – 29th, 1916 by Irish republican leaders to end British rule in Ireland and establish an independent Irish Republic. It resulted in the unconditional surrender of rebel forces and the execution of 15 men who signed the Irish proclamation. A state ceremony is held otside the GPO on Easter Sunday each year where rebel leader Patrick Pearse stood and read out the proclamation to signal the start of the insurrection against British rule. Defence Forces, the Army, the Aer Corps and the Navel Service participate in the ceremony. The National Flag is lowered and the 1916 Proclamation is read by an officer from the Defence Forces. The President then lays a wreath to commemorate those who died in 1916, and a minute’s silence is observed. Very interesting related historical sites to visit in Dublin are the GPO Witness History Exhibition, Kilmainham Gaol and Dublin Castle. 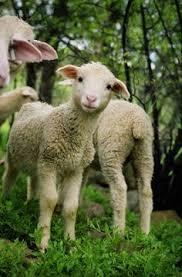 Who doesn’t enjoy seeing baby lambs in the fields in Spring? 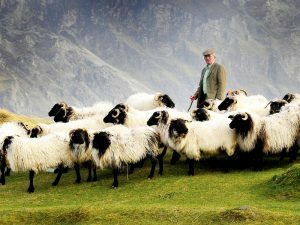 Sheep farming is not an easy industry in Ireland, the more mountainous land in the West of Ireland is often used for sheep farming and the variety of sheep that occupy this rugged landscape is mainly the hardy Scottish Black Faces. They are a tough breed and most often give birth to their lambs on the open, exposed hills. The fox are a threat to the baby lambs when frail but they find their feet fast and always stay close to their mothers for protection. 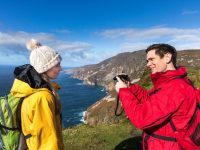 As tourism figures continues to grow in Ireland, Springtime is an even more attractive option to visit the big sites such as the Cliffs of Moher which are much less crowded. You can walk around Dingle at ease and find seats in pubs much more easily than in the peak Summer months of June, July and August. Airfare is typically quite a bit cheaper at this time of year as are hotel rooms in Dublin. 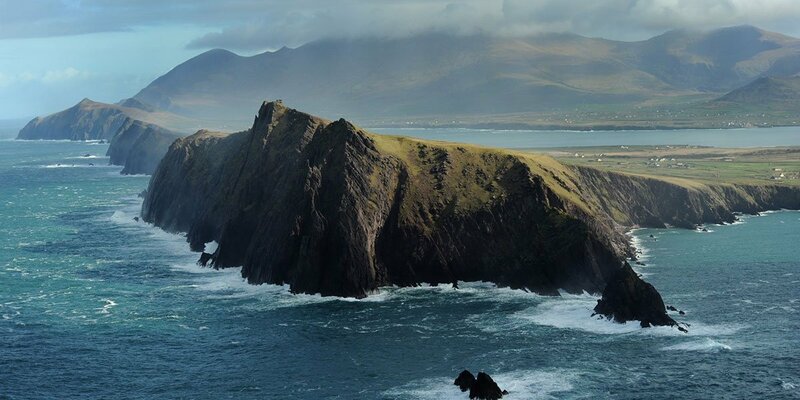 Ireland features a massive range of flora and fauna, from naturally native in the Powerscourt House and Gardens to totally tropical in Garnish Island, Co Kerry which has its own microclimate created by the Gulf stream. Discover the many delights of Irish gardens this Spring in Ireland. The Burren is a unique landscape, a limestone karst region measuring a few hundred square kilometres. The Irish word for the Burren is Boireann, which translates to rocky place. 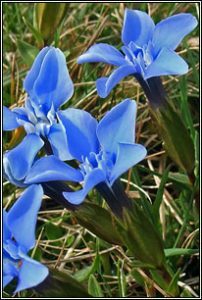 The most famous of the wildflowers for which the Burren in County Clare is famed is the Spring Gentian.